We present an interesting case of a 55 year old post-hysterectomized woman who had a 20-22 weeks’ size mass arising from the pelvis. On imaging studies it was suggestive of a broad ligament leiomyoma, but on exploratory laparotomy it turned out to be an isthmic leiomyoma. A leiomyoma is the commonest benign tumor of the uterus in the reproductive age. It can develop in any part of the uterus or its ligaments. It may also develop in the broad ligaments. If a subtotal hysterectomy is performed, the cervix and sometimes the isthmus are left behind. They can develop any condition that can develop at that site. Thus if the operation has been done for uterine leiomyomas, a leiomyoma may develop there, either by growth of a seedling leiomyoma which had been present at the time of the first operation but could not be seen, or it may develop as a new growth due to predisposing factors which caused the development of leiomyomas in the first place. We present an unusual case of isthmic leiomyoma following subtotal abdominal hysterectomy. A 55 year old woman presented with complaints of pain in lower abdomen for 8 days. The pain was continuous, moderate, and nonradiating. There were no aggravating or relieving factors. There were no bowel or bladder symptoms. She gave history of abdominal hysterectomy having been done three years ago in view of uterine leiomyomas. She had no episode of vaginal bleeding after that operation. She had three normal deliveries. She had a viral infection in the past, after which she had developed bilateral lower limb weakness. The details of that illness were not available. On examination, her general condition was fair, vital parameters were within normal limits and general and systemic examination revealed no abnormality. On abdominal palpation, there was a 20-22 weeks’ size mass arising from the pelvis, which was non-tender, solid, and mobile from side to side. Per speculum examination revealed a flat, 2 x 1 cm polypoid projection from near the left angle on the vault, covered with smooth, flat epithelium. It could not be assessed well because her lower limbs had reduced power and dorsal position could not be maintained well. On vaginal examination there was a 20-22 weeks’ size solid, non-tender mass with side to side mobility, occupying the pelvis and lower abdomen. On ultrasonography (USG), there was a heterogeneous hyperechoic well defined mass with internal whorled appearance measuring 15 x 12.6 x 14.2 cm in the lower abdomen, with no internal vascularity, suggestive of left broad ligament leiomyoma. Computerized tomography (CT) scan revealed a well-defined mass of 18.6 x 14.6 x 13.5 cm in the left adnexa, with no evidence of ascites or lymphadenopathy, suggestive of a broad ligament leiomyoma. Both ureters were passing posterior to the mass, with no compression effect. Her investigations for fitness for anesthesia showed normal results. The lower limb weakness was assessed by neurologists, who advised that the condition was static, and would be evaluated after the abdominal lump was treated by us. Though the imaging techniques suggested that the leiomyoma was in the broad ligament, the side to side mobility of the lump ruled out that diagnosis, as broad ligament leiomyomas are extraperitoneal and hence not mobile. A tentative diagnosis of left adnexal leiomyoma, possibly in the uteroovarian ligament or residual round ligament was made. 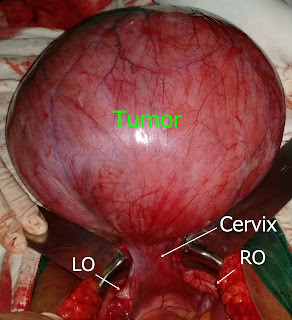 A differential diagnosis of left ovarian tumor was also considered. An exploratory laparotomy was done. A large leiomyoma measuring 25-30 cm in diameter was found to be arising from posterior part of the isthmus of the uterus. The uterine corpus and round ligaments were absent. The ovaries, fallopian tubes, cervix and uterosacral ligaments were present. The cervix was long. A diagnosis of post subtotal hysterectomy uterine isthmic leiomyoma was made. The leiomyoma was excised. The cervical stump was not removed as the relatives did not wish her to have that additional surgery. 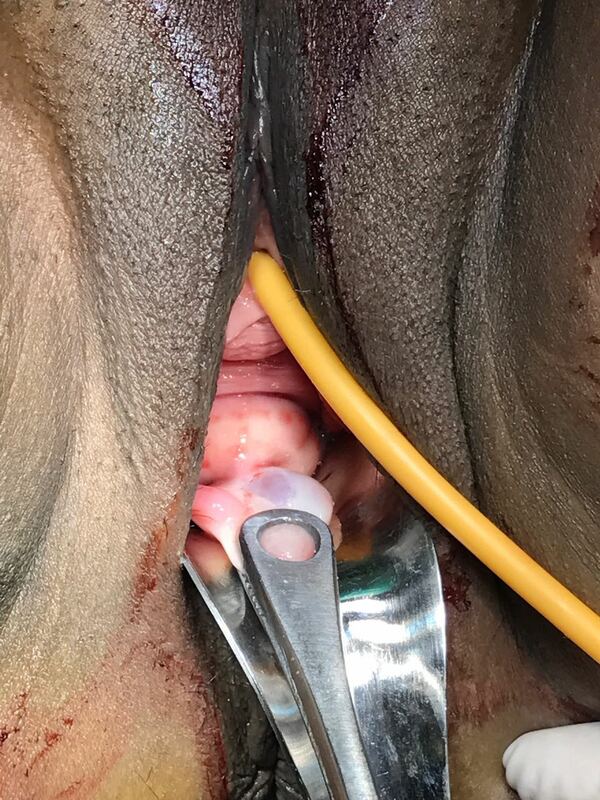 The anterior and posterior walls of the upper end of the cervix were sutured to each other with No. 1-0 polyglactin. It was covered with the peritoneum raised during excision of the leiomyoma to prevent postoperative adhesions. After closure of the abdominal incision, a speculum examination was done. The tag seen preoperatively was found to be a flat polyp arising from the anterior lip of the cervix. It was excised. The patient made an uneventful recovery. The weight of the isthmic mass was found to be 2.5 kg. Histopathological examination of the mass showed it to be a leiomyoma. The cervical polyp was confirmed to be a cervical polyp. Figure 1. Isthmic leiomyoma: Tumor - leiomyoma, LO - left ovary, RO - right ovary, Cervix - supravaginal cervix. Figure 2. Cervical polyp, held with sponge holding forceps. Our patient had probably not been counseled adequately prior to and/or after her subtotal hysterectomy, or she had not understood what she had been told.. So she was not aware that her uterine corpus had been removed while the isthmus and cervix had been left behind. She had lost the records of her past treatment. So these details could not be found out. Owing to her neurological condition affecting her lower limbs, an adequate speculum examination could not be done, and hence the cervix which had been pulled upwards by the large leiomyoma could not be visualized. Her USG and CT scans further made an erroneous diagnosis of a broad ligament leiomyoma. If a diagnosis of isthmic or upper cervical leiomyoma had been made preoperatively, the cervix could have been removed along with the leiomyoma, with adequate counseling preoperatively. Now she has been advised to have Pap smears as per the screening protocol for detection of cervical cancer, and an annual gynecologic examination in order to detect development of any disease that may develop in the cervix. Adequate counseling is essential prior to hysterectomy. In case any difficulty is encountered that prevents a total hysterectomy and a subtotal hysterectomy has to be performed, the patient and her relatives must be informed about the same, and advised to retain all documents related to the operation and have periodic follow-up examinations for development of some disease in the uterine cervix and isthmus. Imaging techniques, though helpful, cannot be totally relied upon when making a diagnosis of the nature of an abdominopelvic lump. VC Buttram Jr, RC Reiter. Uterine leiomyomata: Etiology, symptomatology, and management [abstr]. Fertil Steril 1981;36:433. SF Cramer, A Patel. The frequency of uterine leiomyomas [abstr]. Am J Clin Pathol 1990;94:435. Adamian LV, Kulakov VI, Dzhabrailova SSh. Characteristics of surgical treatment of pathologic conditions of the cervical stump. Akush Ginekol 1991; 5: 60-62. Bojahr B, Lober R, Romer T, Schwesinger G. Large cervix myoma after supra-cervical hysterectomy. Zentralbl Gynakol 1996; 118: 468-470.
van der Stege JG, van Beek JJ. Problems related to the cervical stump at follow-up in laparoscopic supracervical hysterectomy. JSLS 1999; 3:5-7. Markowska J, Markowska A. Total or subtotal hysterectomy? Ginekol Pol 2000; 71: 34-38. Munro MG. Supracervical hysterectomy: ... a time for reappraisal. Obstet Gynecol 199; 89:133-139. We thank Dr Maitreyee Parulekar for taking photograph of the leiomyoma and Dr Durga Valvi for taking photograph of cervical polyp.